1. To make the meatball, combine all the ingredients except the oil and using the hand, form into balls around 1 teaspoon each. Heat pan with oil and fry meatballs until brown on all side. 2. In a pot, boil water with onion, garlic, sesame oil,and bullion. Add carrot and meatballs and simmer for 5-10 minutes until the carrot is soft. 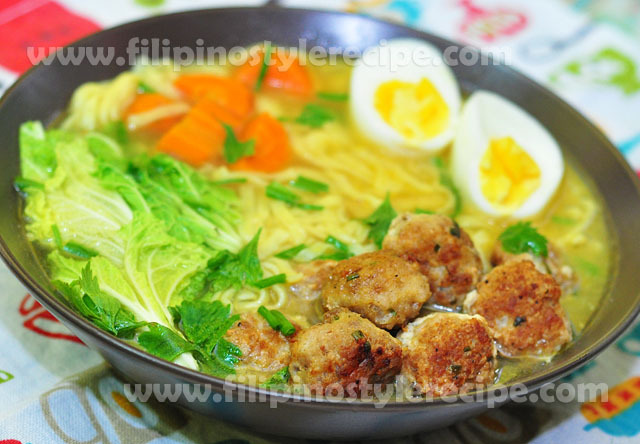 Add the noodles and pechay then let it boil for a few seconds then remove from heat. Transfer to serving bowl and top with hard boiled egg and spring onions. 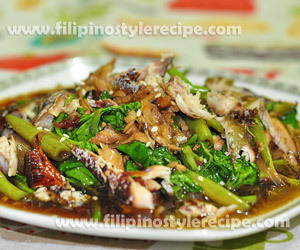 Filipino Style Recipe: Adobong bagnet with pineapple is another variety Filipino adobo together with popular Ilocano delicacy “Bagnet”. Bagnet is a popular delicacy in Ilocos made from pork belly deep fried until crispy and blister on skin. 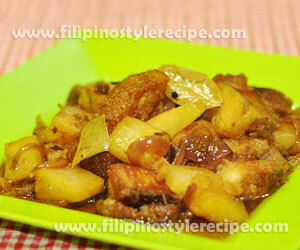 Similar to usual adobo dish, bagnet cooked in a blend of garlic, soy sauce and vinegar. 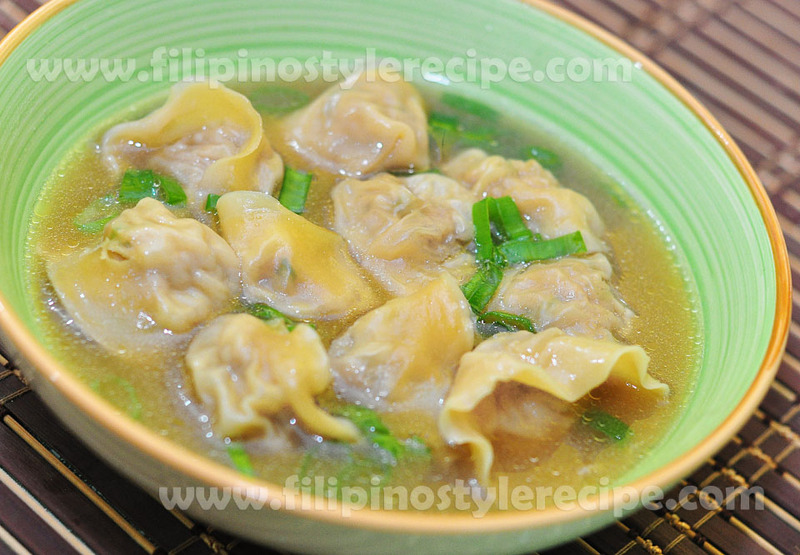 I also used oyster sauce and pineapple for salty and sweet flavorful taste. 1. In a bowl, combine oyster sauce, soy sauce, vinegar and oil. Set aside. 1. In a pan, heat bagnet until start to render oil. Remove from pan and set aside. 2. In same pan, saute garlic and onion. 3. Pour oyster sauce mixture then bring to boil. 4. Add laurel and peppercorn then adjust seasoning according to taste. 5. Add bagnet and pineapple then simmer until almost thick. 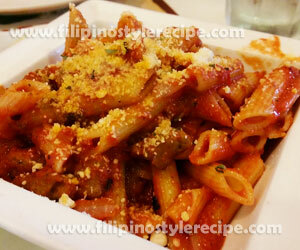 Filipino Style Recipe: Diablo Penne is a popular tomato-based Italian pasta made of Penne cooked together with Italian sausage in olive oil, tomatoes, red chili, basil and other herbs. Served with Parmesan cheese and crusty bread. 1. In a skillet, heat oil then cook sausage and mushroom until evenly brown. 2. Add garlic and onion then sauce until translucent. 3. 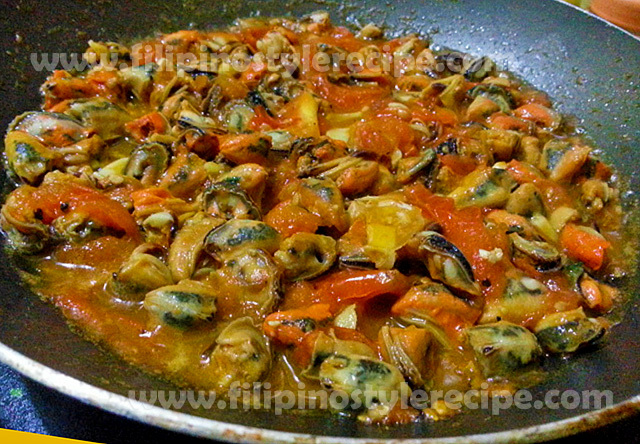 Add chopped tomatoes and red chili flakes then sauce for 3 minutes. 4. Add tomato paste, basil, sugar, salt and pepper then simmer until nice thick sauce. 5. Add precooked pasta then carefully stir until pasta is well coated. 6. Transfer to serving plate then sprinkle with Parmesan cheese. Serve with crusty bread. 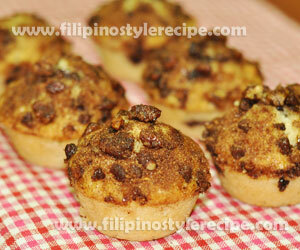 Filipino Style Recipe:When you think of healthy food, you would imagine it to be boring and tasteless. 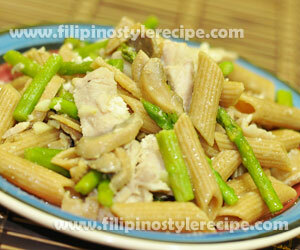 This chicken asparagus penne recipe is low calorie complete meal that is oh-so-yummy and very easy to prepare. 1. Cook pasta according to package instruction. Drain then drizzle with olive oil. Set aside. 2. Warm olive oil in a large pan over medium heat. Saute garlic until transluscent. Add the mushrooms and cook for 3 minutes. Add the chicken and saute until lightly browned. Season with salt and pepper. 3. Pour the water on the chicken, cover and let it boil.Adjust the seasoning as desired. 4. Remove the cover and add the asparagus and cook until just tender around 5 to 10 minutes. 5. Add the cooked pasta, drizzle with olive oil and remove from heat. Sprinkle with parmesan cheese, stir and serve. 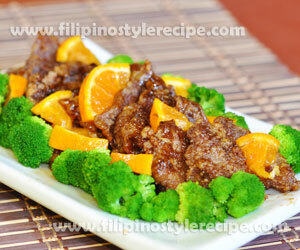 Filipino Style Recipe: Crispy Orange Beef recipe is another mouth-watering beef dish. Normally the beef comes fried in a crispy batter then tossed in thick sauce made of orange juice, orange zest, sugar, vinegar, soy sauce and oyster sauce. 1. In a bowl, combine cornstarch, ground pepper and salt then mix well. 2. Pat dry the beef strips then dredge on cornstarch mixture. 3. Shake off excess cornstarch then refrigerate for 30 minutes. 1. In a small bowl, combine orange juice mixture then mix well. Set aside. 2. In a pan, heat oil then fry beef until golden brown. Drain and set aside. 1. In a same pan, remove excess oil except 1 tablespoon. 2. Saute garlic, ginger and orange zest for a minute. 3. Pour orange juice mixture and orange pieces then simmer until almost thickens. 4. Add fried beef then toss to coat evenly. 5. Transfer to serving plate then serve with steamed broccoli. 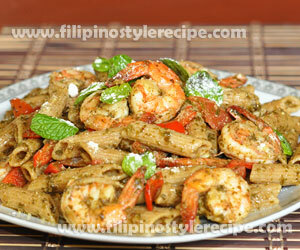 Filipino Style Recipe: shrimp pesto pasta is another simple and healthy Italian pasta dish. This dish is consists of shrimp, pasta and pesto sauce that is made of processed basil, pine nuts, extra virgin olive oil, salt and pepper. Estimated time of preparation and cooking: 30-40 minutes. 1. In a food processor or blender, process chopped basil, pine nuts, salt and pepper until blended. 2. Add extra-virgin olive oil then continue blending until combined. Add more olive oil if needed. Set aside. 1. In a pan, heat oil then add shrimp and cook until color turns to pink. Remove from the pan and set aside. 2. In a same pan, saute garlic, onion, and tomatoes until softened. 3. Add bell pepper and then pesto sauce. Adjust seasoning according to taste. 4. add pasta then toss to coat evenly, add shrimps. 5. Prepare shrimp and pasta on pasta tray then top with Parmesan cheese. 6. Garnish with remaining basil. Serve and enjoy. 1. You may also use ready made pesto sauce in supermarket.